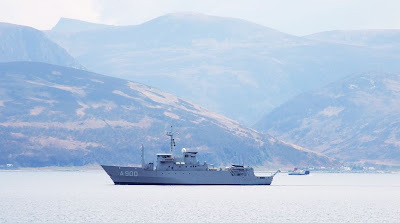 The Dutch Navy's Submarine Support Ship and Torpedo Recovery Vessel MERCUUR was seen exercising today off the north end of Arran. Commissioned in 1987, this 1,400 tonne ship is 64.8 metres in length, and has twin screw diesel electric drive. She is equipped with two Oerlikon 20mm guns, and and well as being able to launch and recover torpedoes, MERCUUR is able to act as a minelayer. This ship was in Dublin on 2. May. 2008.